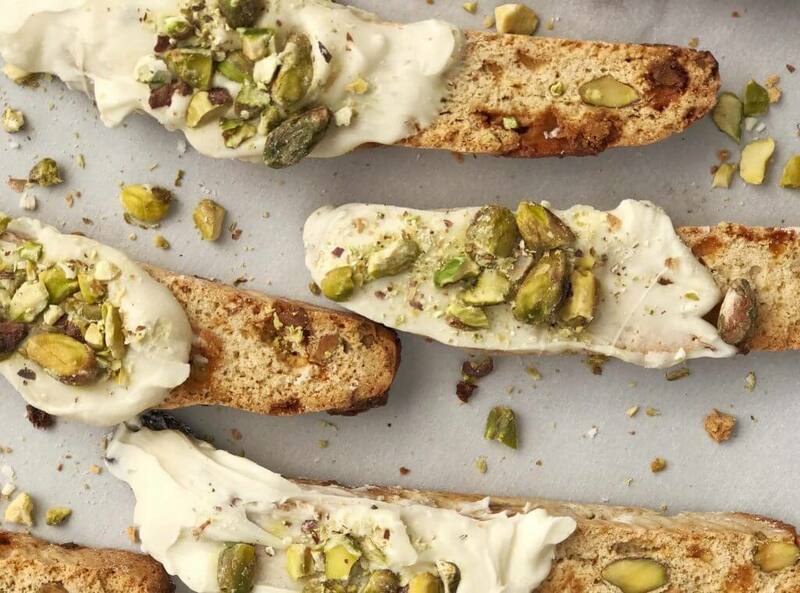 Easy homemade biscotti makes the perfect holiday hostess gift especially when it is packed with flavor like this Pistachio, White Chocolate and Cardamom Biscotti. 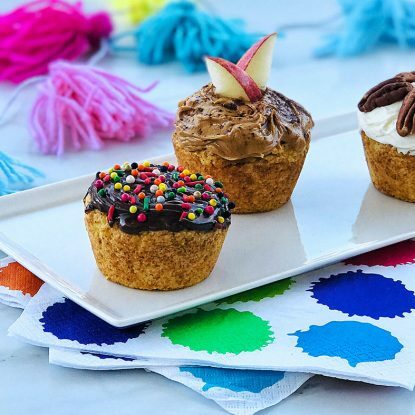 Make it your signature recipe by picking your perfect chocolate drizzles and toppings. 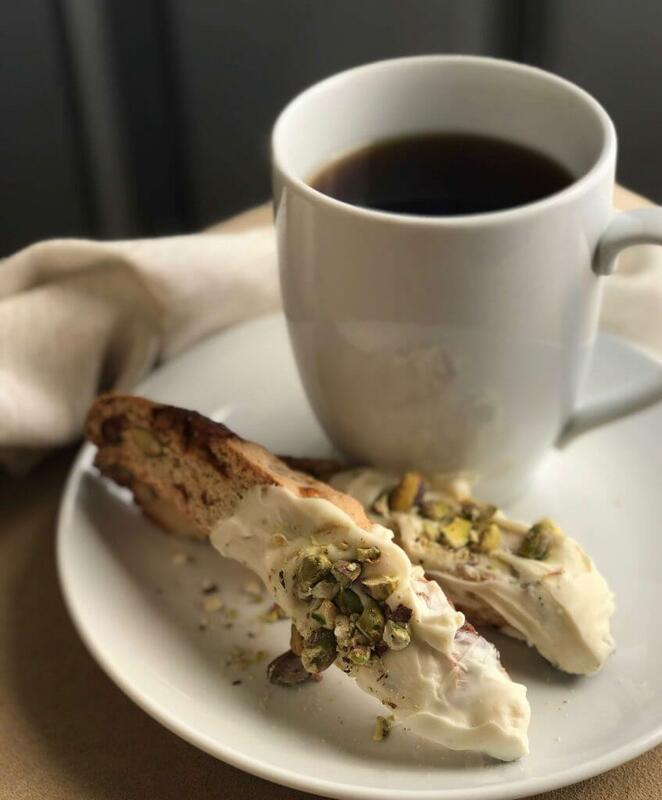 Whether packaged together for a delicious holiday gift or enjoyed alongside a steaming mug of coffee for an afternoon treat, these Pistachio, White Chocolate and Cardamom Biscotti add festive crunch to any holiday gathering. 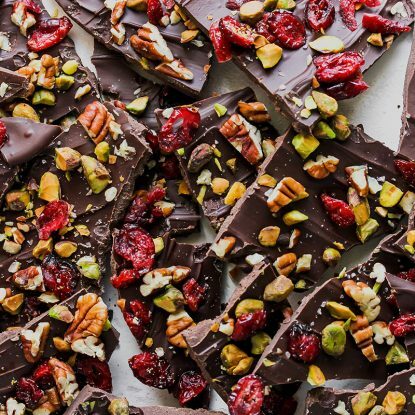 Make them your own by swapping white chocolate for dark, adding finely chopped favorite toppings for a pop of flavor and color, or pairing them with a delicious local coffee for the perfect hostess present. Swap the white chocolate for dark chocolate for a new flavor experience or keep the white and drizzle the finished biscotti (pistachios and all) with melted dark chocolate. Add finely chopped sweetened dried cranberries or dried cherries for a pop of holiday color and a sweet flavor. Don’t be discouraged when the biscotti come out of the oven feeling soft. They will harden and get to their crispy coffee-worthy dipping texture as they cool. Store biscotti in an air tight tin, jar or Ziploc bag at room temperature for up to two weeks. What is your favorite food to gift during the holidays? In a medium sized bowl, whisk flour, baking powder, cardamom and salt. In an electric mixer fitted with whisking attachment, beat sugar, eggs, oil, and vanilla extract until well blended, about 1 minute. Add dry mixture to wet mixture and mix until smooth, 1 minute longer. Stir in pistachios and white chocolate and mix just until incorporated. Dough will be lumpy until shaped. 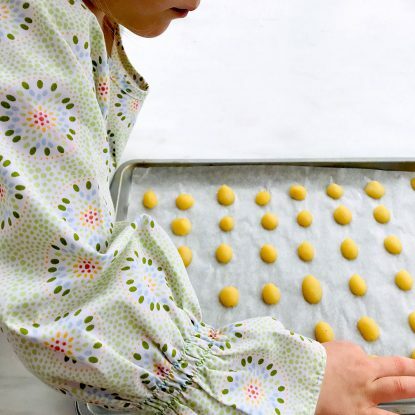 Using as much flour as needed to prevent hands from sticking to dough, shape dough evenly into one log on baking sheet. Pat log to be about 3 inches wide, 8 inches long, and ¾ inch thick. Bake log until golden colored and almost firm to touch, about 30 minutes. White chocolate will bubble, that is ok. Cool log on baking sheet, away from oven, for 15 minutes. Reduce oven temperature to 325 degrees Fahrenheit. Using a very sharp knife, cut each log into ½ inch thick slices, on the diagonal. Turn each slice, cut side up, on same baking sheet with space in-between each piece and bake for an additional 30 minutes, or until golden brown. Biscotti may appear soft but will continue to firm as it cools. Once biscotti is cooled, melt white chocolate in a double boiler. Dip half of each piece of biscotti in white chocolate. 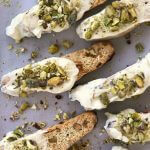 Sprinkle with chopped pistachios if desired. 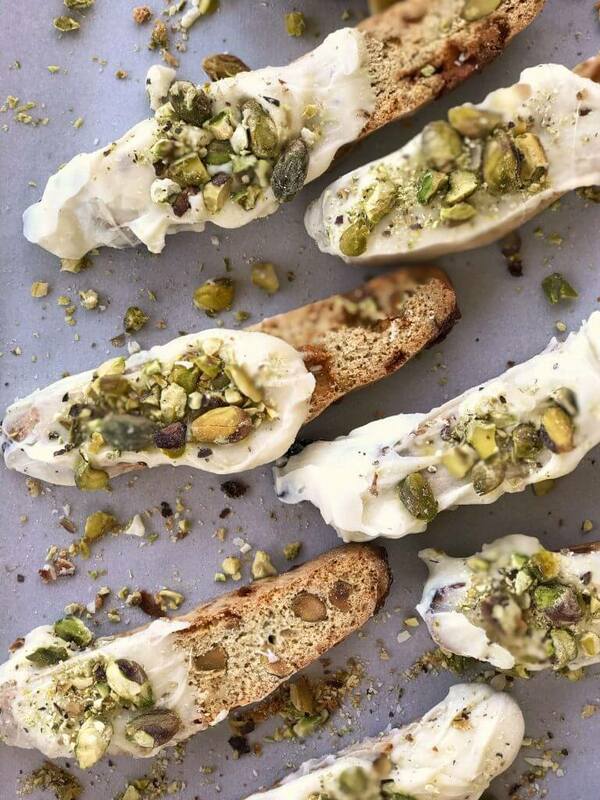 Easy, homemade Pistachio, White Chocolate and Cardamom Biscotti makes the perfect holiday hostess gift or delightful treat with coffee.